'All About Presentations' by Jazz Factory: What is your Goal? Every presentation must has a clearly defined goal. Sounds too simple and obvious? Are you saying, "Of course I know why I am making the presentation. How can I make a presentation otherwise?" Old readers of the blog might recall a survey I conducted among managers. I had asked what they hated most in a presentation. The results was surprising. The 3rd most disliked thing in a presentation was 'the presenter's lack of clarity on the purpose of the presentation.' While you might think it as obvious, your colleagues are clueless on what you are talking about. The solution: You need to write down your goal on a piece of paper. This clarity on your goal (purpose) will help you frame your message better. A presentation can have multiple goals. As discussed in the last post, a salesman can choose to generate leads (contacts), warm up the leads (share information and make you more interested) or close the sale. Every sales presentation is not meant to always close the sale. Having this clarity will help you know what to talk and what to set aside for future. 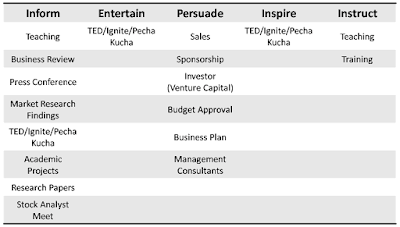 On July 11, I made a list of 15 types of presentations. 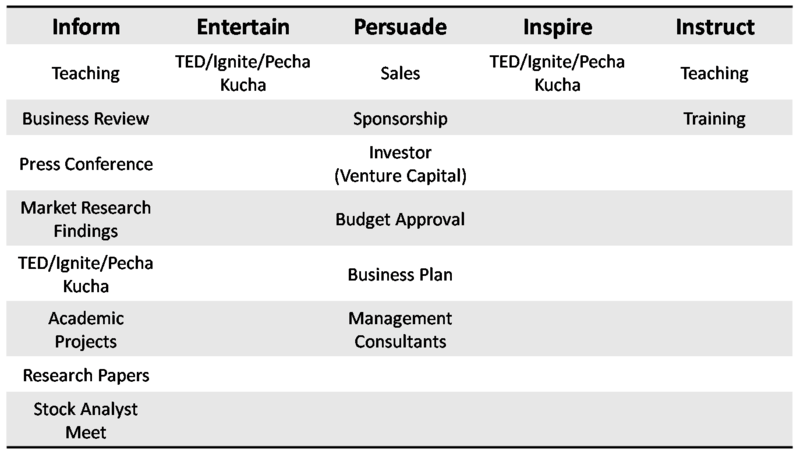 Let us see if all these 15 types of presentations can fall under these 5 categories. All the 15 presentations indeed fall under one of the categories. What is worth noting is that most of these presentations are trying to inform others or persuade others. What is even more important is that most presentations where the stakes are high are about persuading (convincing) others. 1. Decide on a goal for your presentation. A goal which makes you better off. 2. Write it down for your reference. 3. Your goal is going to determine what you will say in the presentation. This post is part of the on-going project on this blog 'The Presentation Code' where I am trying to unravel what is common to all presentations. To find out the DNA and be able to ace every presentation. I would also suggest to know the audiences' goals for the presentation. I have given "to inform" presentations in which some of the audience didn't want that information. Sometimes they thought it was based on incorrect or out-of-date data. Other times they did not agree with the analysis (my opinion about the information based on the data). In hindsight, viewing their goals would have better prepared me for the objections. This is true. While we are trying to figure out our goal, prioritising them and writing it down, we should spend time finding out the goal of the audience. Unless these two are in sync, we are in for trouble. How do you suggest we find out what the audiences' goal is?